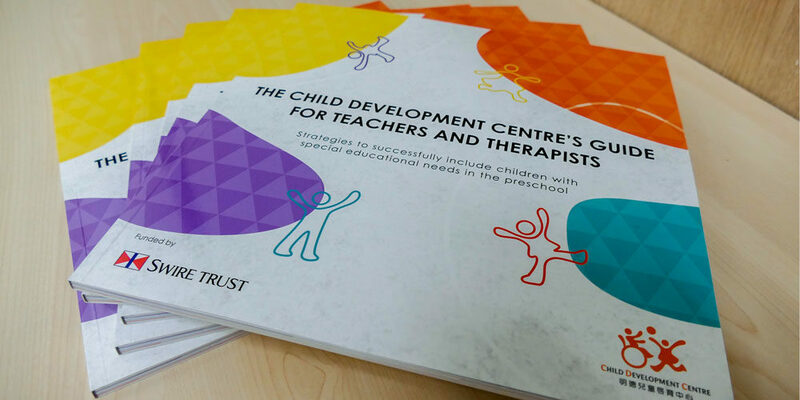 With over 40 years early education experience in Hong Kong, The Child Development Centre’s (CDC) multidisciplinary team has combined their extensive experience to produce the “Guide for Teachers and Therapists: Strategies to successfully include children with special educational needs in the preschool”. Sponsored by The Swire Group Charitable Trust’s generous funding, the project commenced in January 2016. We have been honoured to have highly distinguished overseas and local educational experts review the Guide. With easy-to-use strategies and top tips, the Guide is designed to assist teachers and therapists in supporting children who have additional needs in preschool settings. It also provides a resource to use in staff training. “I strongly recommend this Guide, which has been created by a team of teachers and therapists working at the CDC. It contains a wealth of information for the professionals working at the Centre, but also for those in other settings where young children who have special educational needs are receiving the support they need and deserve. I hope it will be widely used, so that it may benefit many children and help to guide those who support their education and development.” recommended by Dr Rona Tutt, OBE, the past president of the National Association of Head Teachers of the UK. We were delighted to launch the Guide on the 25th October, 2017. The information-sharing session was attended by practitioners and professionals working with young children. Every attendee received a copy of the Guide and learnt about its development and ways to utilise this resource. In order to gather valuable feedback and comments, a closed Facebook group has been created. We hope this group will provide a forum where early-years professionals can share their individual experiences in using the Guide. In response to overwhelming sign-ups, two extra information-sharing sessions were arranged. In addition, we will also deliver tailored sessions in other settings for professionals in preschools/organisations, with a minimum number of 15 participants. If you are interested in further information or would like to receive a copy of the Guide, please contact Ms Joan Ho at joanh@cdchk.org or 3462 2846.